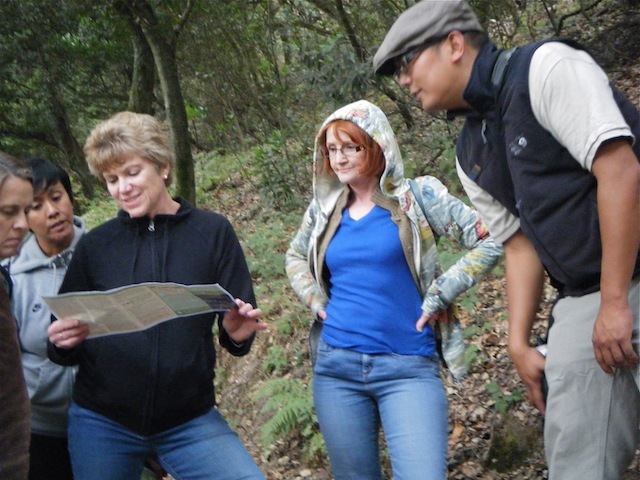 Naturalist Francis Mendoza (right) helps hikers discover the local flora on the Tuesday Twilight program at Huckleberry Botanic Regional Preserve. A group of hikers recently gathered at Huckleberry Botanic Regional Preserve for a Tuesday Twilight walk, part of a summer series offered by the naturalists at the East Bay Regional Park District. The fog rolled uphill from the Golden Gate Bridge and across the Bay, cooling the air and cutting off the top of Mount Diablo in the distance. The pungent bay trees' musky perfume scented the moist air. While we hiked the three-mile loop, examining the unique native flora, folks shared their favorite hikes and chatted about staying healthy and hiking for fitness. 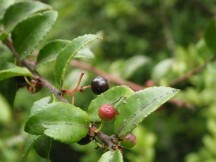 Huckleberries, found in the parks, were just coming to ripeness. Healthy Parks, Healthy People (HPHP) is a national movement afoot in the Bay Area, bringing people out to the parks for a healthier lifestyle. Hoofing it in the parks can help people achieve their fitness goals as well as relax and improve their mental outlook. Spearheaded by the East Bay Regional Parks and the Institute at the Golden Gate, 26 agencies are part of HPHP Bay Area and include physicians and health care professionals. Daphne Miller, a local family physician and associate clinical professor at University of California San Francisco, wrote an article for the Washington Post, “Take a hike and call me in the morning.” These "nature prescriptions" could really help adults and children struggling with obesity, diabetes, and other negative health trends resulting from our more sedentary lifestyles. Obesity and many of its associated chronic diseases, such as diabetes and heart disease, currently affects 1/3 of adults in the United States and, disturbingly, 17% of our nations children and adolescents. Low-income, inner city areas are disproportionately affected with “1 out of 7 pre-school children obese and at risk for chronic disease,” according to the Centers for Disease Control. 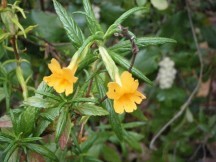 Sticky monkey flowers lent summer color to the trail at Huckleberry Preserve. One of the benefits of Healthy Parks, Healthy People, along with healthier living, is developing a new appreciation for our local outdoor spaces. This, in turn, could generate a new group of park supporters who advocate for preserving our nation’s natural resources. There are initiatives underway to create new interest in getting kids and adults back to nature and more active. Take the Trails Challenge (East Bay Regional Parks), hike with San Francisco Rec and Parks, Discover the Forest and participate in the Let’s Move initiative. Visit the Healthy Parks, Healthy People website to get started with an easy hike or to find your next adventure.